I bought a Noel candle at the Nashville Flea Market. It’s the jumbo kind made of hard plastic. It will be really pretty on the front porch with my Christmas decor. 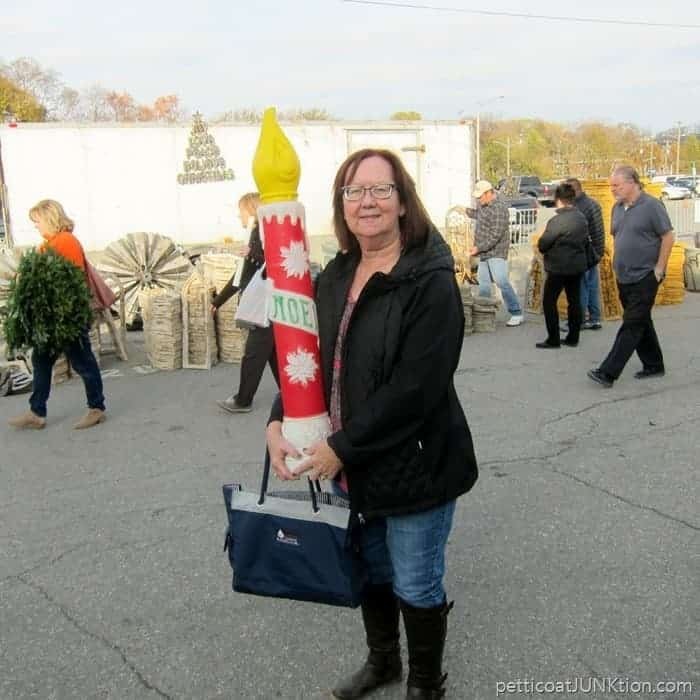 See…..me and my Noel candle. You guys know how I hate to be in the photos. I asked the JTS to take this photo. I’m trying to be more out there. I thought this was a vintage candle but it’s not. I Googled Noel candle and found out you can buy the same candle at Walmart for $100. Who would pay that for this candle?? I paid $20 and that price was stretching it for me. The candle I found online had a battery operated light in the yellow flame top. Mine doesn’t have a light at all. I don’t know if it had been removed or if it never had a light. The flame pulls off so I bet there was a light kit inside at one time. 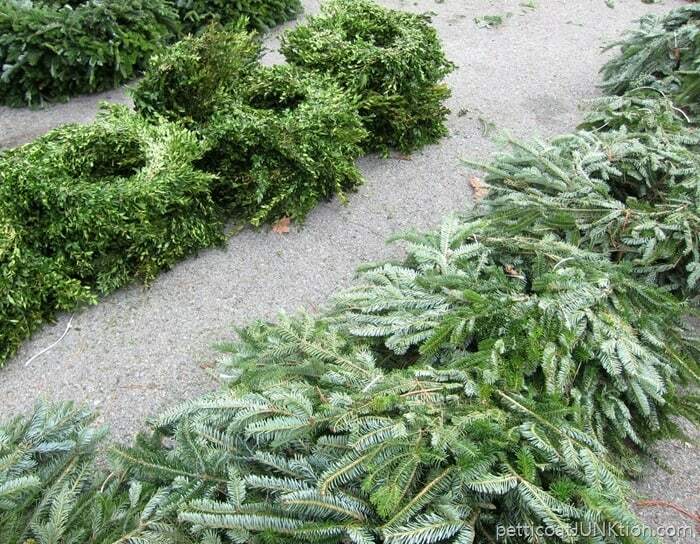 What about the fresh boxwood and fir wreaths. They smelled so good. This vendor had garlands also. Vintage and new Christmas décor. I like everything is this photo especially the green and red table. The prices in this booth are not in my budget…..by a long shot. The horse and the green basket are too cute for words. My love of anything iron or metal plus the turquoise paint had me drooling over the candle holders. Too pricey again. I believe the vendors in general have increased their prices. Could just be me though. Maybe I’m getting tighter with my money. The chair parts caught my eye too. The chippy turquoise paint is the perfect color. The price for both pieces was $40. Again, too high for me. Oh, the things I could do with those metal boxes. 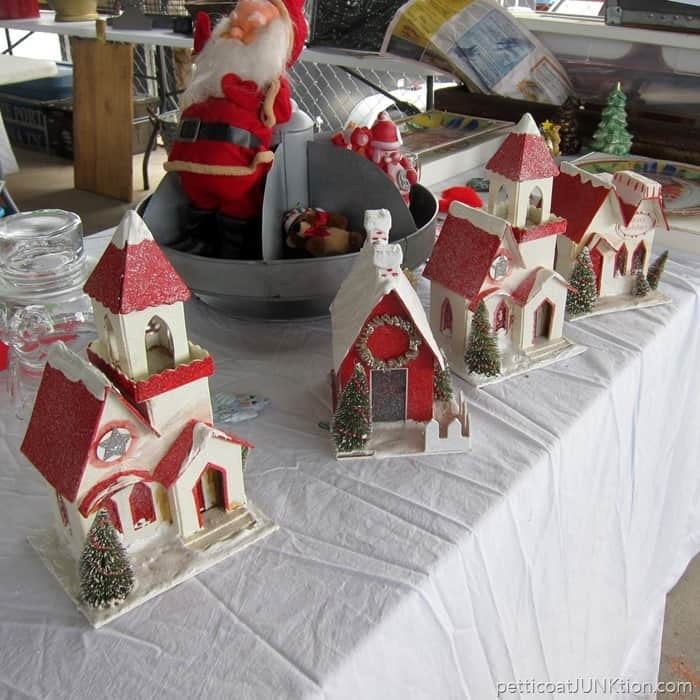 I REALLY loved the Christmas village with the pops of red. Each piece was $15 so I didn’t buy a single one. My only purchase was the Noel candle. Furniture is hard to come by these days. I wonder why that is. Would love to hear from some of you guys about prices at your local flea markets, thrift stores, etc. Have the prices gone up and do you see furniture for sale? Have a great day and I’ll see you tomorrow. I have a really fun project for tomorrow. Can’t wait for you to see it! Oh wow that looks like so much fun. I moved to Alabama late summer and my son lives in Nashville. Is there a website on information on this flea market and if you know any in Alabama that is good? Have a Merry Christmas and enjoy that candle . I lucked up the other day. Found a blow mold nativity set for the yard. It only had 2 wise men, but I bought it anyway. 8 pieces for $25…score! 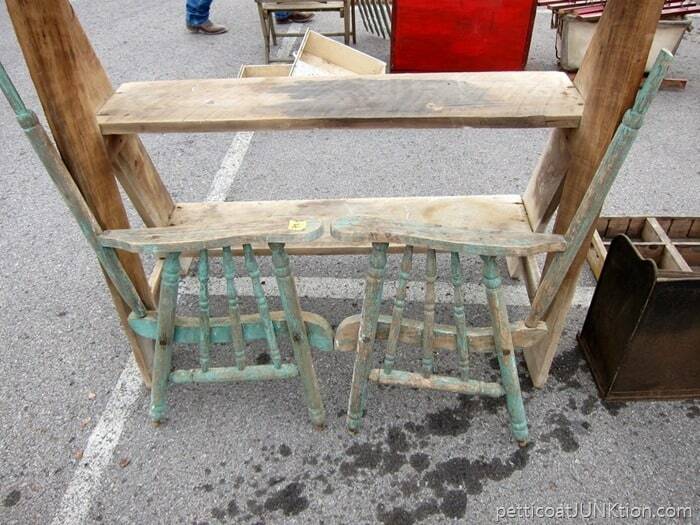 I love Nashville Flea Market also, and a lot of cool things up there are too pricey. You did score!! I’m jealous. Congratulations! kathy actually found the same candle on amazon for $29. Just need to purchase an Led bulb separately. Love your blog, Kathy. 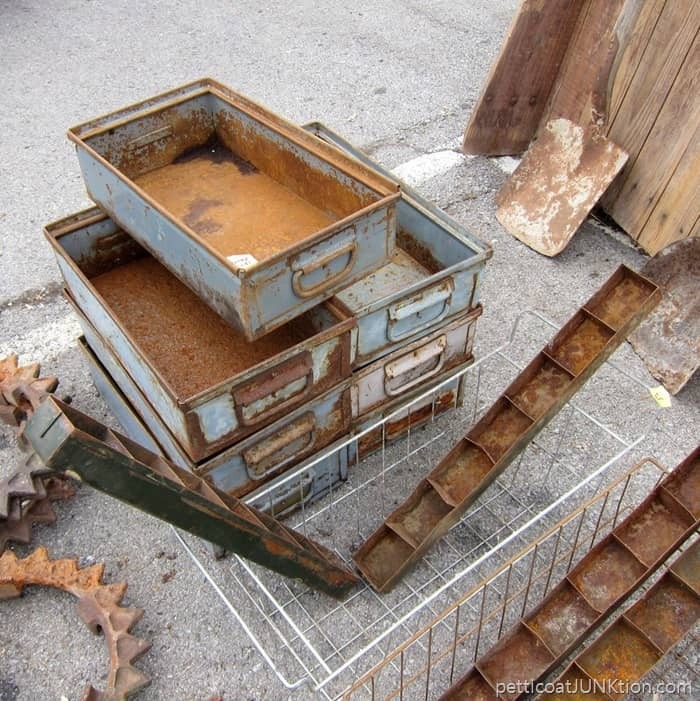 How lucky you are to have a mate who enjoys junking, er, I mean treasure hunting with you! I found a cute, really cute, plastic reindeer on the 127 Yard sale two years ago. He was $25 bucks (high I thought) but I had never seen one like him. He is standing in front of my old radio flyer wagon where Santa is standing in, they look great together. Found a newer Flexible flyer sled out for trash pickup this summer. It only needed to be nailed back together! And it had a Goodwill price tag of $25 on it. Prices on everything seem to be higher and I also find it hard to come across real wood furniture. I love the night before trash pickup day! I believe prices have increased because of all the DIYers. That’s unfortunate, because I used to buy older things because I liked them and didn’t upgrade them. Now almost impossible to enjoy antiques stores anymore. 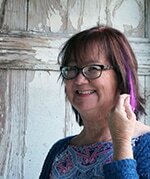 Kathy, I always look forward to your blog. What a feast for the eyes the market must have been. I don’t shop fleas markets only just very occasionally, so I don’t know whether they are charging more now. If so, does that mean that you can charge more for your up-cycled or refurbished items and still make a profit? I do know that the thrift stores in my area have, which I frequent all the time, have certainly upped their prices over the last year and a half to two years. I have sticker shock at almost every retail store I go in, so I don’t know if I’m a good one to ask! Ah, thanks for the sweet words Naomi. I can’t charge more than I normally do. Our market area is pretty low on prices. I don’t make much at all on my painted pieces. Loved the tour! i think you got a good deal on the candle. It’s fun to look through other’s stuff. Have not been to a good flea market in a while. Hopefully, back in action next summer. Thanks Mary. I bet you miss the shopping. I would. Me too. I bet you like tomorrow’s project. Hi. Love reading your blog. I am in Michigan and furniture prices are ridiculous. I believe prices have gone up because so many people are in to painting furniture. The unique pieces go fast and all that’s left are the MDF pieces like entertainment centers. I feel your pain. Thanks for the kind words on the blog. I love you guys. I think they have raised their prices. I have seen this happen many times over the years. Everybody is on the band wagon. How was the market? I had to much going on to get out there. There weren’t as many vendors and you saw my one purchase. Prices are too high. 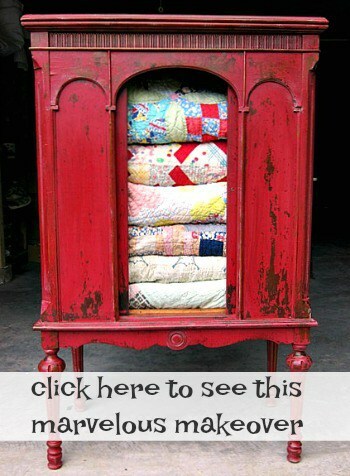 More and more people are doing the upcycling like you. Prices at my thrifty places have gone up here in NC, too. 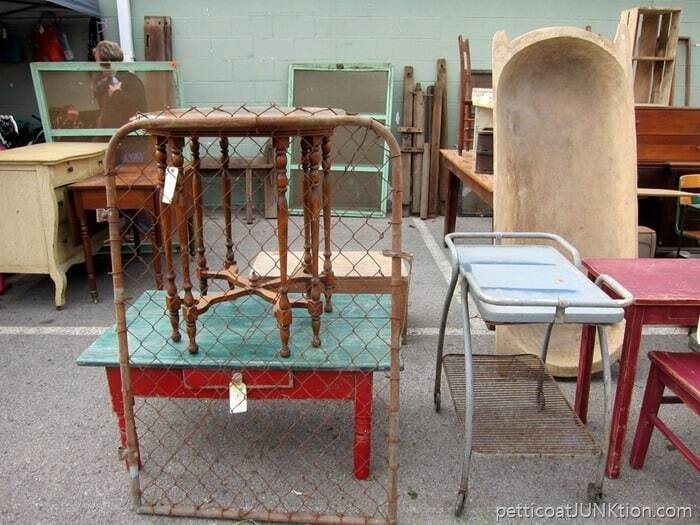 My husband and I travel around TN and surrounding states (namely KY & AL) antiquing and thrifting (junking) and find that most furniture is well out of my range, especially to flip. 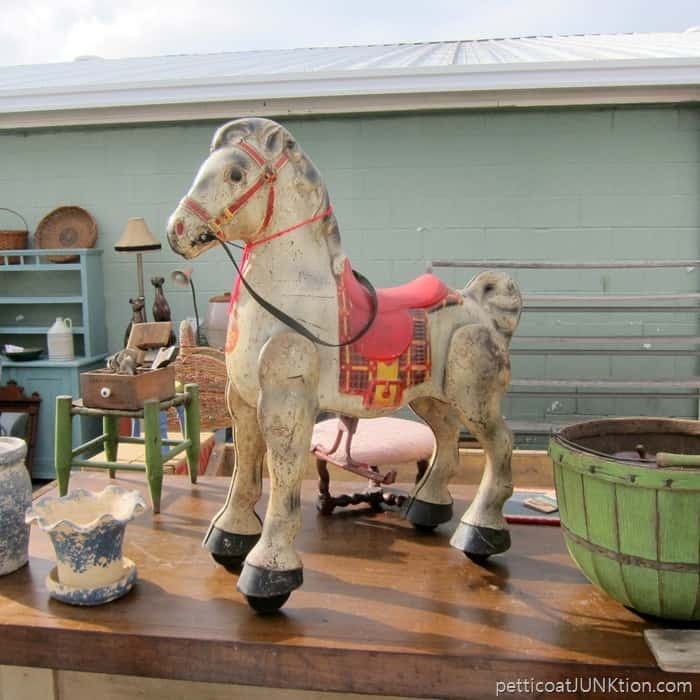 Antique prices varies from store to store. I find NASHVILLE prices a little on the high side for antiques. And it seems that stores we visited last year and thought the prices were good, have increased a bit too. 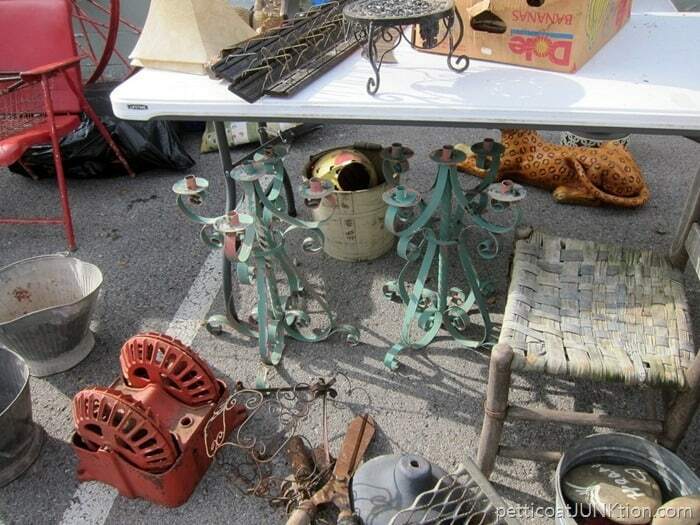 As far as flea markets, I love our NASHVILLE flea market and not many compare. Hopefully we will stumble across a good one in the future. you look good with your candle. I also love the chair parts! I was there this weekend— first time, and I loved it!!! (Confession: I looked for you) I had a time constraint so I only got through about 1/3 of it!!! Can’t wait to go back!!! You should have sent me a Facebook message or something!!! I would have loved to hang out. Maybe next time?? I enjoy your Post, soooo much. Keep up the good work. Send some ideas along, too! I think prices are going up because of booth fees. We have an annual antique fair in our small town and I know the cost to rent a space is over $300 for just one day and also the venders have to give a percentage of their sales. We see less vendors every year. ? Hey cuz. In your area for a week. Let’s get together. That tour made me DROOL! Thanks for sharing! 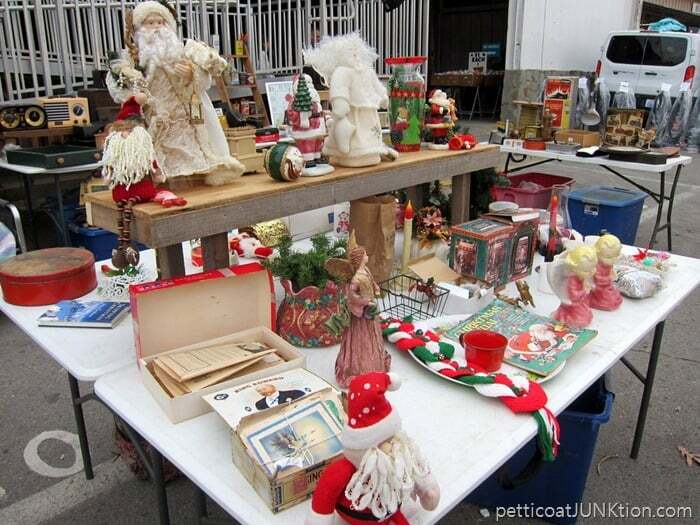 And yes, these places ARE catching on that people like us are actually BUYING junk…..I mean, treasures…..!!!! !